Krept and Konan have come along way since their “Otis” freestyle which made people sit up and pay attention. A Guiness World Record for the Highest-Charting UK album by an Unsigned Act for 2013 mixtape Young Kingz, countless other awards including MOBOs and a BET Awards later and the pair are now ready for the world to hear debut album The Long Way Home. Krept and Konan have a gritty past which includes shootings and selling drugs and the duo certainly don’t let the listener forget that. “Fell Apart” details some of that hardship; not having money on debit cards, not being able to afford electricity and the death of Krept’s step father. “But if I get arrested and let the fans down, I’d be a fool,” Krept raps on the song which is an inspiring one. “Think About It” is easily one of the best songs on the album if not the best; the production, chorus and verses are all on point. The song has more of a mellow dance vibe than Krept and Konan’s usual sound but it’s a great move. The album’s lead single and Jeremiah assisted track “Freak of The Week” is another of the album’s high points. The dancehall inspired production, which includes an obvious nod to Beenie Man’s “Who Am I” and party vibe make this a dead cert for carnival. Whether the two part songs are necessary is hard to argue, the short clips on the end of “Fell Apart/ Lucky Ones” and “FWTS/ Active” do little for the album. Perhaps the only positive is that “FWTS/ Active” is the only track on the album to feature a UK rapper; Skepta. The album’s interludes are another thing that the album could have done without with. The “Wait For Me” interlude consists of vocals that are almost inaudible because they’re played over each other at a similar volume. The song’s bridge sets up the scenario that the song is about well enough, without the need of an interlude. The “Fell Apart” interlude features a three yea old Konan singing about bills alongside his mother, having his mother on the album is a nice touch though. Long Way Home is a big album, probably the UK’s biggest budget Hip Hop album ever made with collaborations with the likes of Rick Ross ("Certified"), Ed Sheeran ("Dreams")and Emeli Sande ("Roses"). It is surprising that the only UK rapper featured on the album is Skepta, especially when rapper Yungen is part of Krept and Konan’s Play Dirty stable. The Wiz Khalifa assisted “Do It For The Gang” sounds like a reject beat someone made for Chief Keef and the album could have easily done without it. To make matters worse, Wiz Khalifa’s verse sounds like a rushed freestyle and has nothing notable about it. "You still don't hear us? Then we’ll grow on you” - Krept on "The Long Way Home"
Lyrically there are few that can compete with Krept and Konan and on the album it shows. The duo outshine the album’s collaborators on every song and that’s no mean feat. The album’s collaborators include Hip Hop heavyweights such as Rick Ross and multi platinum singers Ed Sheeran and Emeli Sande. It is a shame that The Long Way Home is let down by too many average songs, as this could have been something special. 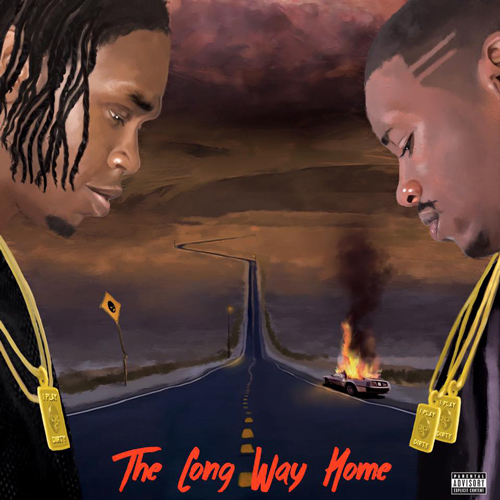 Krept and Konan's The Long Way Home is out now on iTunes, Google Play and Spotify.